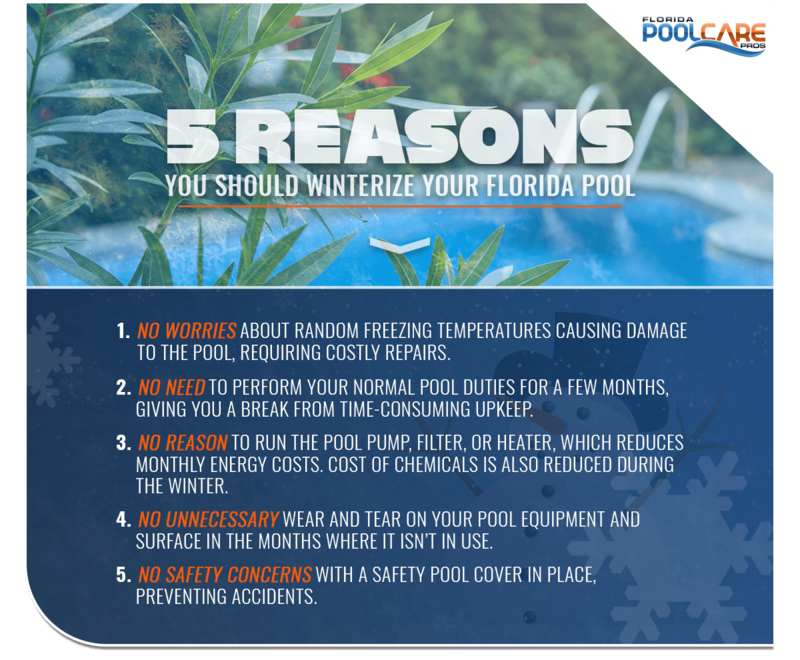 While we’re lucky to have very mild winters here in Florida, that doesn’t mean you shouldn’t winterize your pool. Even if you don’t go through the full winterization process, it’s a good idea to take some steps to help your pool stay in good condition throughout these cooler months. Today, we’ll be taking a look at some of the steps you should take to prepare your pool for the winter so it’s ready to go once spring rolls around. If you need help with your pool care tasks, call Florida Pool Care Pros. We’re proud to provide reliable pool care in Seminole County, Celebration, and Davenport. No matter if you’re closing the pool down completely or you’re keeping it open, this is a good opportunity to give your pool some extra care. Not only does this cut down on algae buildup, it will also help prevent stains from setting in and keep pumps from getting clogged up. Be sure you’re clearing any leaves from the pool using a leaf skimmer, as they can cause stains and promote algae growth if they aren’t removed. Any debris that has sunk to the bottom of the pool should be cleared out with a pool vacuum. Just like in the summer, you should pay attention to the chemicals in your pool. If you’re going to be closing the pool, make sure the chemicals are balanced at least one week before you close it. Good benchmarks to keep in mind as you do this are 80 to 120 PPM (parts per million) for alkaline levels (depending on the size of your pool) and a calcium hardness level of 200 PPM. If you’re keeping the pool open, you don’t have to lower the water or drain pipes, as Florida rarely sees freezing temperatures. All pool toys and accessories should be taken out of the pool before closing up. If you’re going to be using a pool cover (which is recommended, for reasons we’ll get into shortly) detach your ladders and handrails for storage. Make sure there aren’t any items that can collect rainwater left behind, such as pool floats or inflatable loungers. Not only will they get in the way of the pool cover, but the accumulated rainwater also creates a breeding ground for mosquitoes. At the very least, you should use a safety pool cover during the winter. This will keep debris from getting into the pool, reduce the amount of chemical and filtering tasks you need to perform and keep your family safe from falling in on accident. Make sure the cover doesn’t have any tears or holes where debris could get in. Taking these steps to prepare your pool might seem overwhelming, but you’ll thank yourself once you’re ready to open it back up again. Need some help getting your pool ready? Call Florida Pool Care Pros today to schedule an appointment. We provide reliable pool care in Seminole County, Celebration, and Davenport.